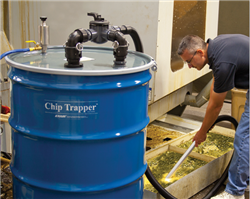 EXAIR's 110 Gallon Chip Trapper removes solids such as chips, swarf and shavings out of used coolants and other liquids with its compressed air power. It vacuums the dirty coolant or liquid into the included 110 gallon drum; while trapping all the solids in a reusable filter bag. There are no motors or impellers to clog or wear out. It features a built-in pressure/vacuum relief and an automatic safety shutoff to prevent spills or overfilling.